I love the library. I could honestly spend hours & hours roaming around. I love the fiction of course, but I could really get lost in the non-fiction aisles. Unfortunately I usually don’t have hours & hours to roam. I usually just check out the “What’s New” aisles on the first floor. That’s where I discovered this gem of a book. OMFG. This book is amazing! I love the way it’s laid out. There are categories of cookies such as “Soft & Chewy” “Crumbly & Sandy” “Light & Delicate”, & a photo index at the front. Yes, you heard me, a photo index! There’s a photo for EVERY recipe! I had originally seen the book sometime over summer, but didn’t check it out. Then, over Thanksgiving break I began to think about Christmas cookies to make, so I went online and requested this book. I was so excited when I got the email saying it was there waiting for me! This is the first recipe I tried. I wanted to make something that seemed simple, but that seemed different from any recipe I’d made before. I settled on the Buttered Rum Meltaways. I was drawn to the fact that this dough needed to be put in the freezer for at least 30 minutes, and up to one month. So I could easily make the dough, and then bake it right before a Christmas party! These little babies definitely appeal to a grown-up palate. The mix of spices & addition of rum has warm mature flavor! So yummy. 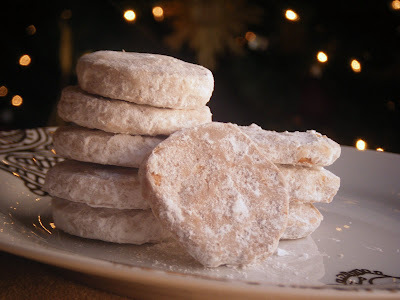 adapted from Martha Stewart "Cookies"
Whisk flour, cornstarch, spices, and salt in a bowl. Put butter and 1/3 cup sugar into the bowl of an electric mixer fitted with the paddle attachment. Mix on medium speed until pale and fluffy. Mix in rum and vanilla. Reduce speed to low, and gradually mix in flour mixture. Divide dough in half. Place each on a piece of parchment paper; shape dough into logs. Fold parchment over dough; using a ruler, roll and press into a 1 1/4-inch log. Wrap in parchment. Chill in freezer 30 minutes (up to 1 month). Preheat oven to 350 degrees. Unwrap logs. 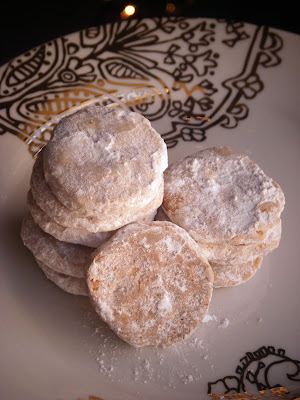 Cut into 1/4-inch-thick rounds; space 1 inch apart on parchment-lined baking sheets. Bake until just golden, about 15 minutes. Transfer cookies to wire racks; let cool 10 minutes. Gently toss warm cookies with remaining 2/3 cup sugar in a resealable plastic bag. Cookies can be refrigerated in airtight containers up to 2 weeks. PS. If anyone wants to get this book for me for Christmas, I would be incredibly happy. These cookies were delicious!!! Thanks for sharing! I love how this book is laid out, and checking it out at the library certainly seems like the way to go! These cookies look just dreamy! Oh, wow. Those sound delicious. And it’s nice to pull some dough out of the freezer and have a homemade treat very quickly. I wish I could get it together well enough to do that! Those look so yumym and I love that last pic with the lights in the background! Erin, your blog is just full of beautiful, delicious foods that I can’t wait to make!! !